God who calls you into His own kingdom and glory. My kingdom is not of this world. If My kingdom were of this world, My servants would fight … but now My kingdom is not from here. § Waiting till His enemies are made His footstool. The kingdoms of this world have become the kingdoms of our Lord and of His Christ, and He shall reign forever and ever! § You . . . have made us kings and priests to our God; and we shall reign on the earth. § I saw thrones, and they sat on them, and judgement was committed to them. And they lived and reigned with Christ for a thousand years. 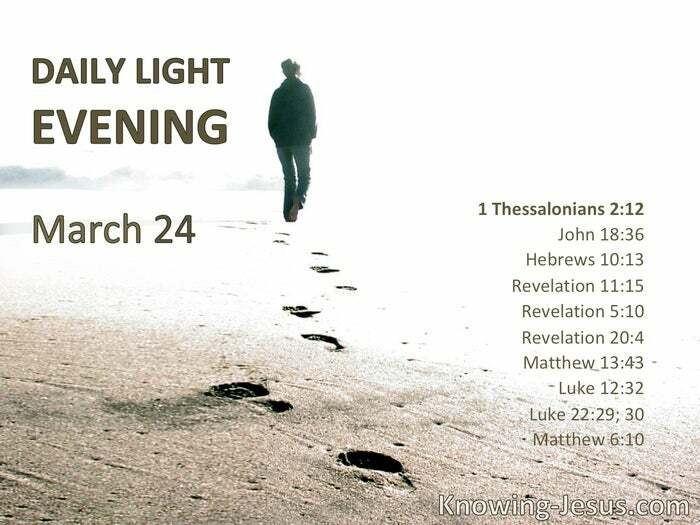 Then the righteous will shine forth as the sun in the kingdom of their father. § Do not fear, little flock, for it is your Father’s good pleasure to give you the kingdom. I bestow upon you a kingdom, just as My Father bestowed one upon Me, that you may eat and drink at My table in My kingdom, and sit on thrones judging the twelve tribes of Israel. § Your kingdom come.